I briefly considered this for the chapter cover picture, but Aeris looks way too carefree, as you’ll see/understand when/if you read the chapter. Last night I stayed up until around 3:00 writing summaries for all of the chapters up to and including 9, because AO3 has a place for chapter summaries, and I thought that would be nice to do. Now, it’s just a matter of updating all of this information here, on tumblr,, and on Deviant Art. I’ve also done some tweaking of earlier chapters, so I want to repost those with the updates. There will more than likely be a fourth edit of Chapter 9, because I’ve done some significant fixes, not story-wise, just in how it sounds/flows. It’s truly amazing how you can edit something numerous times and still miss things. Whenever I do more than just change a word or two per paragraph, I always want to go back through it one more time to make sure it goes over properly. I suppose I could change my editing methods to go back through what I edited the day before (which is how I did The Serpent’s Tale), but in all honesty, I haven’t found much difference in the number of errors I find or the time it takes. Each edit does become easier in terms of I do more reading-through than editing each time, but editing reading is still different from regular reading. Quote: “Couples, master?” Aeris asked, and Sephiroth frowned then to consider. His brow furrowed deeper. “I suppose we are, my Aeris. I protect you and ensure you’re safe, and…you make me incredibly happy.” He blinked once, gazing down. “You bring meaning to my life, little one…” The Cetra sighed as she leaned against him and her smile tore the threads of his heart. I added in information about the actual battle mechanics, which I forgot to do when I first wrote the Gameplay section. I also made significant progress on the Story section. I don’t know why the hell I thought it wouldn’t be elaborate. 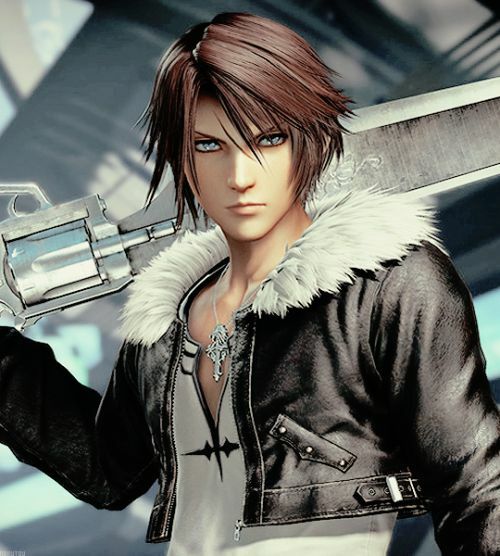 This is Final Fantasy! The Wikipedia entry on it specifically leaves much to be desired. It only gives bare bones, so I’m hoping my memory can fill in the blanks. I want to e able to talk about it in my special long-winded way, so I need to lay down the story adequately enough to do so. I was going to work on the review before doing this update, but I’m one sleepy Narcissist today. I had an awesome outing yesterday with two of my old coworkers who were kind of my old managers, too lol. We went traipsing around the King of Prussia mall ending up right back at the place we originally had breakfast for coffee and dessert. If you ever have the chance to have a honey, vanilla latte at the Grand Lux Cafe (or anywhere I suppose. Starbucks probably makes something like that) TAKE IT. So good. After mani/pedis, we parted, but decided that a bimonthly reunion wouldn’t be out of the realm of possibility. Since I’m an introvert, it’s refreshing to have people who don’t drain my energy. I left tired, but in a great mood, but the former meant I had to skip another event that night. Alas, such is life. Everyone has been so astute with that! I could see that being a picture for Northern Lights, but not this story. Way too many terrible things have happened. Maybe in a hundred more years? I really love the phrase ‘tore the threads of his heart’, very evocative. Thank you! In my head I’ll often imagine characters like that with literal black threads holding their hearts together. It’s a pretty cool gothic image. There’s a few times I’ve envisioned them or someone else sewing up the wounded heart, which is just a wee bit morbid hehe. It really does encourage the whole beta reading idea, I’ll say that, because someone else will be able to pick up on things you just consistently miss. I read aloud, too, and it is much better at catching things. You pay more attention when you read aloud an actually look more a the whole word unless with regular reading. Whoa…that is a major editing miss hehe. Sometimes I wonder if maybe I missed the transition when things are that blatant. Love the gothic imagery – sewing up a wounded heart, brilliant! Oh! Beta reading is when you get someone else to read your work before you publish it. Sorry for the confusion! I don’t think the reading aloud has a name per se. I think it’s called beta reading in the same vein as beta testing. That way you have some fresh eyes on your work and they can potentially pick up things you might have missed. I used to swap with my one friend, and we’d give each other feedback. Aha! Thank you for clarifying 🙂 . Friends who write are very useful for that – I’d be sunk without it. Seriously. That other perspective has helped me out so many times. 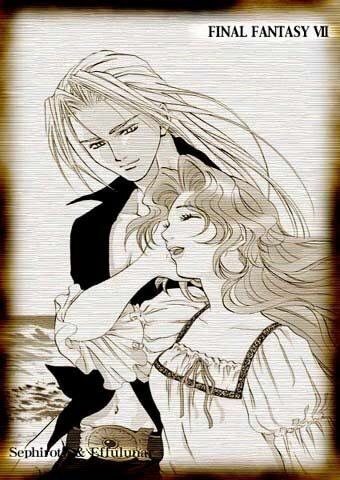 I love the picture… It does seem like it would go with a much different iteration of the Sephiroth/Aeris pairing, though. I can’t wait to read the next chapter!! Me? Oh, I’m finishing the (final!!!!!!!) edits of my thesis, and catching up with my blog posts. I’ll also eventually be starting to edit my play again, to see if I can get it good enough for a community theater to put it up! Those were my thoughts exactly! I could see it in my prior story Northern Lights where she’s much more carefree, but not this one. Yay! Congratulations! You must feel much more relieved now that the goalpost is in sight. I swear catching up on blog posts is like another job hehe. I’ve been behind myself for some reason. I usually can clear them all out by the weekend, but I was busy on Saturday, and just that one day behind means I’m still behind. Then today I came home from work and took a nap, so I just finished posted my weekly gaming update. Adulting is hard. Good luck with your play! That would be amazing.